Their access has been restricted on the forums, and access has been suspended to the game server. I can't disclose the reasons why yet, as I'm still doing the investigation. As I get more facts and information, I will keep you guys informed. We discovered that there is a collaboration behind the scenes between Fornad and Finrod about 'a merge between AC and MCME' which I did not know off. Upon this discovery I preventively revoked his rights as I only had clues and wasn't fully aware of the entire story. Turns out that on April 28, both Fornad and Finrod wrote a document that discussed an idea of how a merge between AC/MCME could take place. This morning Fornad, Finrod, Kulmo, Credoo and I talked about this discovery. Because we felt this as a breach of trust, Credoo is taking position as Head Designer for a few weeks, until this level of trust can be re-established and things clear out. I merged the threads in the Staff Discussions in order to move the issue into the public. Removed the poll as this is about discussing what has happened first, and since the majority of people (staff) are not fond of the idea, and the information is not readily publicly accessible, it makes it hard to judge and form an opinion on the matter. You have to take in mind that this discovery is just an idea, and this thread is being disclosed publicly to inform you of what has happened and why the sudden change happened to Head Designer. There is nothing being done regarding this matter to merge both communities apart from talk and threads. Devil fish is back! hide! Now seriously: I hope this mess and whole situation will be resolved. Somehow. Intentions may have been good and came from someone who is really involved with the server life but doing something like that behind back of the rest (I dont know full background), knowing both servers and communities will never end good. I'm mostly disappointing in what happend. It could have gone allot worse so I'm glad there is not to much damage. My trust however has been harmed a bit. Now I don't need to know everything secrets can exist etc etc but when I ask someone and I do not get an honest answer in return it hurts. Especially from those who I trusted before. A merge with Ardacraft will only happen on our terms if it happens at all. What and how and if cannot be answered right now but we will try and keep you guys updated when we figure out what will happen next. However did does not mean anything changes on the short term continue to work on your project as you did before. Things might change on the long term or they might not. That being unsure there is no use to make any plans untill we know more. So continu as you where doing before. Meanwhile I am here if you have questions issues etc etc. Hopefully trust is regained faster then we can say "Gondor is finished" then Finrod can have his red name back. Edit: You realise this all came to light a few hours ago? Many of you probably were wondering exactly what has been going on in the last 24 hours, and why I have been temporarily demoted to Designer. Firstly I would like to cast off any suspicions about the actions of Fornad and me. Around a week ago, we both came to realise that what we wanted - more than anything - was for the two communities of MCME and ArdaCraft to come together and build Middle-earth as one. In order to organise our thoughts, we made a Google document and sent PMs to one another on the MCME forums. To begin with, Q only found out about the PMs, and since they didn’t clearly show what our intentions were he assumed the worst - that we were planning on downloading MCME’s map, or something of that nature. In hindsight, we should have made Q aware of our thoughts as soon as possible, but at that time we were in the earliest stage of the idea and therefore were not able to present it to a greater audience yet. That was a mistake and I must apologise for it. All the time I had the rank with the red name I lived up to what it stands for in any possible way I could: Keeping MCME a friendly and safe environment for everyone and make it get as good as it can only get. There’s many things in my life that had a much greater influence on my very personal future than such an online community could ever have. But the time I have put into MCME so far exceeds everything. However since I accepted the offer of Credoo to take the Head Designer rank, almost all new things I was confronted with, was drama. And the major part of that drama was about this everlasting conflict with ArdaCraft. There was many a late evening that I used for writing one of these long posts pointing out my view on the matter, and after that I used to literally dream about these two communities uniting under one banner and standing in for one goal, instead of using half the passion and energy we have to defend one project against the other. What I thought to be nothing more than one of my wildest dreams, proved to be a vision that does not only haunt me. By chance Fornad revealed that this would also be what he deeply longed for. It caused a very odd situation, two communities showing not much of a mutual friendship, and then me and Fornad sharing this crazy dream. I am willing to put all I have ever given for MCME on the line for this dream. The desire of all players on both servers is to create the best Middle-earth possible. I believe that this merge is the best way to achieve that goal. I know many of you have problems with ArdaCraft. But where do these problems come from? The rivalry and actions of some of their players? Some of our players have done similar things to them, and after a merge this ‘rivalry’ would no longer exist. Stealing our best builders? This would no longer be a problem. Advertising themselves on other sites? This would also no longer be a problem. How would such a merged server look like? The basic idea is really simple: Take the best from both projects and combine it to create something greater than either of them alone could ever be. I have witnessed it many times on the server by now: Subtle or less subtle comments that areas are too small in scale. Complaints that there is not enough jobs and most of those that there are, are boring river or root fixing jobs. That I have to remind some people not to build castle after castle but to also complete the terrain. That it would be nice having this and that texture also in all other packs, or having this and that new texture added, while our texture artists search through the inventory desperately looking for free blocks and trying to estimate how many blocks future regions will still need. The wish that we had more blocks, or more paintings - or more builders. For builders from the ‘Golden Age’ like Fresh, Ben or even Aando to return. My deepest desire is to fulfill these wishes. 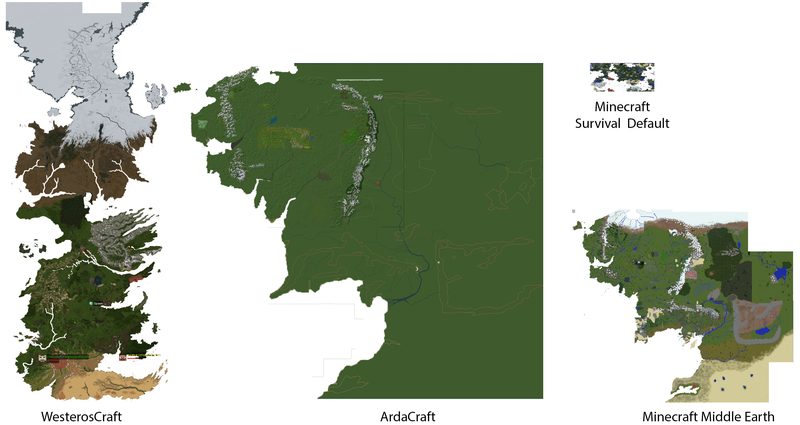 More concretely, a merged server would most certainly be based on the map ArdaCraft is currently using. It will allow us to have much more accurate and pleasing scales in cramped areas like the Shire, Osgiliath and Minas Tirith (comparison picture: http://i.imgur.com/WqwvZJM.png). It will - and that would be by far the most important part of the merge - allow us to lay the voxel arrow down for most of the time and focus on villages, castles and any larger structures beyond that. In the MCME Times you would no longer read about some terrain changes here and there all the time. Beyond that it will be by no means that I and Fornad will “dictate” which aspects of which server get picked. We will make suggestions of course, but the discussion on all these points can and will be opened to every single member of the community. It will take time and energy, but I truly believe it would be time and energy well spent. what is going on, idk people are saying keep working on your projects but everything we are doing could get thrown out the window. All ive heard is some ppl were trying to combine us with a bunch of people that are either banned from this server or disliked the system we have played into. If its such a big plan im not sure why anyone should be kept in the dark, but there are secret documents ppl are making, and all this map downloading nonsense, that nobody has said anything about but its on the infractions register, and how mr. Finrod asked all the staff member if we wanted mods at the last meeting, which i thought was very strange at the time, but now makes sense. How long has this combination plan been a thing? Secret pvp, false apologies. meeeehhhh. Hey Fin, glad you decided to explain everything. Going to merge topics i see a lot of difficulties. I want to know how did You plan to solve them. a) server ownership, map ownership - because both q and Fornad own these maps who will be the final owner? Was that even discussed? b) Opinions about merge/community approval from AC side - we know that a lot of people there left us becuase they either: disliked our builds/map/planning system/some of us. They still may do it. Do they even know about Fornad's plans? c) mods support - as we clearly said - we do not want mods and AC is heavily modded and lanucher dependant. Are they able to even live without them? Or maybe its us who should start to be modded, but I dont really see a success with that atm. e) general non-staff drama - You mentioned drama but there would be even more among artists and non staff members. Many people would dislike potential RP changes (16->32, blocks changes). I also think our map could be bigger and we could spent less time on terrain. But theres a lot of technical difficulties for now (conversions/pasting/RP). As this moment I am undecided. I think, if we can sort out everything in a way that works for both parties, (before we actually change anything) then hell yeah lets do it. Why should we not? I pretty much got the same thoughts like despot. Yes, we have the same goal, but we approach it from so different perspectivs that a merge, even if its possible, might not be the best idea. Also It would most like mean that we would have to rebuild everything, so it would be a start from zero. I think we could loose many players through that. I also dislike the system of their launcher. I dont want to wait 10min until i can play on the server (yes i need that much time with their launcher -.-). And i dont think they would want to change that. I guess at the end it would be an adjustment to their standards, while mcme's style could die out. It doesn't matter what topic is, it doesn't matter if it's a stupid thing or an important thing, but it matters when you do that without telling anyone and plotting in the darkness like KGB. @Finrod_Amandil the reason why all this drama happend isn't because the merge between mcme and arda but it's because you basically plotted with fornad without telling anyone. As someone else already said for other things, talk with staff and q before doing and planning stuff, because it's like you don't consider us to be trustworthy to know, and that's not really a cool move. May i suggest some sort of meeting to talk about this, im slightly confused currently. Sure I can share you on teamspeak the information i have. Not that it will become much more clear after that but it might help a little. This idea is very attractive on the surface, and there are benefits for both servers. We could certainly benefit from their map, and they could benefit because we have a higher member count. However, as everyone else has said, the move would be extremely difficult. Not only would we have to deal with the mods, texture packs, etc., the two servers have such an intense rivalry that a merge could only result in a loss of members. It would be like the US and Russia uniting at the height of the Cold War - though both sides would definitely benefit, the hatred each side has for the other would prevent a successful unification, and both sides would just end up killing each other. Really, before we can even talk about a merge, we need to ensure that all members are friendly toward one another. Perhaps a good start would be to host a joint pvp or survival server. Needless to say, make sure to post the outcome of the discussion with the arda members, in their ts, in this thread. I'm sure everyone (like myself) who cannot participate will want to know what exactly has been said. First we need to stop the rumor mill and make a statement. - There HAS TO BE a document, locked later saying what is taken from where (AC/MC) and what changes would be included both on merge and LATER after some time (like adjusting style, resizing etc). This document should include both general lcoations (regions/towns) and specific builds (like MT citdel, Osgo dome etc). If something is merged from MCME it could not be changed in extend it could be considered a full rework without pointing it in this doc. - Everyone would have more or less agree to the idea. Like @Fireinferno13 . - Launcher will be open source. We could check code/compile it ourselves (safety/security reaons - verification etc). Lastly. This idea will be discussed only among staff members for now. Public announcement would be made only after final agreement from staff. Therefore no free promotion for AC if idea totally fails. Thats kinda what I would like to see from my side. However I expect some people will be totally against it (merge idea - myself I am not supporting it withour some security etc etc) and I do not think we should ignore them.